Just after receiving a fashion icon award right out of the hands of THE Anna Wintour Rihanna jetted out to one of the world's top fashion headquarters- Paris. While there she stopped by to hang with some fans to launch her Rogue perfume line at Sephora, and today chilled with them even more at the big reveal they've been waiting on for days. Hard Rock Cafe has been trying to prepare Rih's Navy for an exciting announcement for about a week now. The anticipation was building up to the very moment Rihanna appeared on the stage. In a generous gesture to Rihanna's charity The Clara Lionel Foundation- Hard Rock Cafe Paris has donated $200,000 to the foundation named after her Grandparents. The store also helped launch the sell of a shirt that will be sold to raise funds for the foundation. Even more cool for fans is that the artwork on the shirt was created by one of them. Again, it's pretty cool to be a fan of Rihanna's. She has all sorts of resources at her fingertips, but loves to incorporate her fans where she can. While some are calling this the launch of The Clara Lionel Foundation, that is not the case. We've been hearing about the humanitarian foundation for a while. Most notable mention was her generous gift of equipment worth about $1.7 Million a couple of years ago to a facility in her homeland of Barbados. This is just a collaboration with one of America's most loved restaurant/store chains. Surely it will bring more awareness to her humanitarian efforts, her foundation, and the causes it supports. It's also a really cool way to encourage many more people to get involved in charity work. 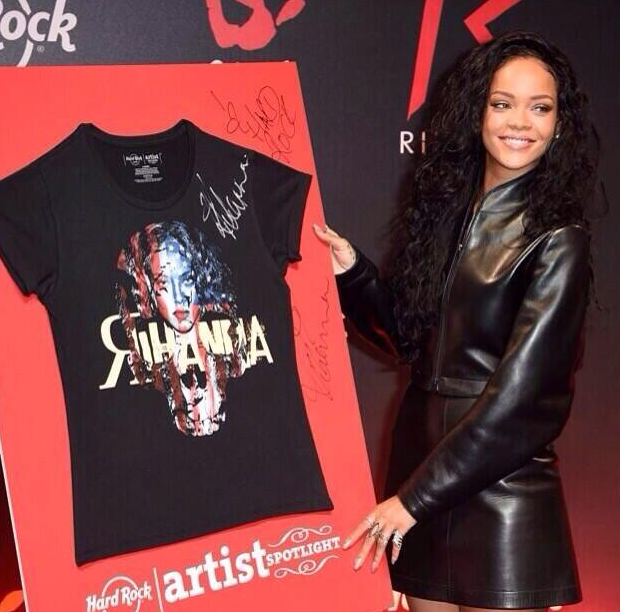 You can purchase the Rihanna Clara Lionel Foundation Tee at HardRock.com. Here's to hoping this event/cause will get as much pub as her choice of dress for the CFDA awards.